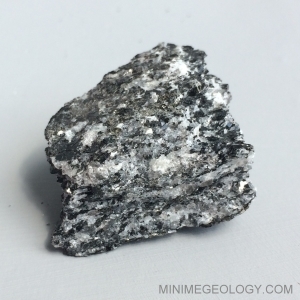 Granitoid gneiss is a variety of metamorphic gneiss that appears to have bands of black and white minerals such as feldspar and mica. These bands form from the heating and squeezing of the rock although, granitoid gneiss may look very similar to the original granite rock. Granitoid gneiss is medium- to coarse-grained and occurs around the world.